After working my last DXCC entity this spring ( Scarborough Reef) I started to wonder what it would be like to be on the other end of the pileups "To Be the DX". Could I handle the pileups with multitudes calling, to pick out one call, give report and log at a fast rate? Having minimal experience along these lines with the exception of operating a few IOTA/Lighthouse expeditions to the outer banks of N.C. and the annual local club field day pileups it would have to be a rather simple expedition. A. since the other hobby is growing palm trees, I would like to go where it's warm and can see said trees above some blue-green water. C. time for sightseeing during the day with opportunities for the artist xyl to paint. 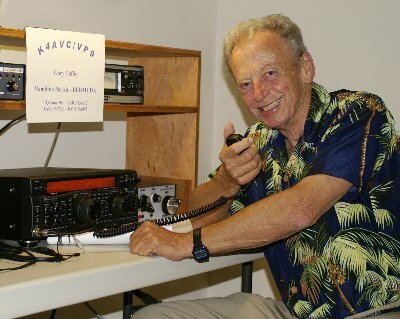 Ed Kelly, VP9GE, was known to facilitate getting a reciprocal license for U.S. hams and after sending a good picture via E-mail of my license it appeared within 2 days. Now that's a great service. I mentioned that I would like to be the first foreigner to also get permission to operate sixty meters from Bermuda......He said, "Can't hurt to try". Although other friends offered little hope and I had little also, a proposition to the Department of Telecommunication in Hamilton produced a positive response. I was ecstatic, must of danced around for a long time in a state of euphoria. I was granted permission to run some propagation test on 5,403.5MHz for the weekend October 12 -13th, 2007. The rest was easy, reservations by Expedia.com and we checked the passports for expiration dates, packed some wire and radio that I had modified for sixty meters. Later Ed said that the radio was not needed. So after a short flight from RDU/ Atlanta to Bermuda found Ed waiting to pick us up for the short ride from the airport to Ed's spacious Tarrafal Apartment 7, overlooking the Atlantic Ocean. I was shocked. here was a FT-920 waiting, antenna tuned for 5.403.5 and all I had to do was press the mike switch and start logging. That convenience sure beats renting a boat, loading up masts, antennas, fuel, tents generators like several to some IOTA expeditions I used to do. In the autumn of my years maybe I can't do that anymore. During the daylight hours my wife and I visited, using the Bermudian pink buses, the Botanical Gardens, the Royal Naval Dockyards, Bermuda Underwater Exploration Institute, and many trips to my favorite laid back town, St Georges. Several meals were enjoyed at the Whitehorse Pub & Tavern and also participated in feeding the fish with food scraps. Also sometimes there is a dunking in the bay of a convicted local "Nagger" wench. The tourist are invited to help. Linda painted scenes at several locations, one time while watching the submarine, owned by Paul Allen, a co-founder of Microsoft, working offshore. This could be seen most everyday from Ed's apartment on the hill. Suddenly Friday night rolled around and with first CQ on 60 about a dozen stations were calling me. Gradually the pileup was manageable and for the rest of the weekend had great fun communicating with stations on the east coast plus some Texans and into Kansas. The total contacts were 71 for the weekend, which is not very much when compared to 100,000 QSO for the Super Big Expeditions but one has to start somewhere. I would of liked to stayed another week. For a reasonable ham radio expedition I heartily recommend Ed's apartments. Even if not planning a ham vacation it's still a super deal and seems like Mr. Kelly is the epitome of Southern hospitality.